If upping your exercise game featured in your New Year’s Resolution this month, then you’re going to want to read this! No matter whether it’s an after-work HIIT class or crack-of-dawn yoga, for many of us, the potential pitfalls that threaten to derail all our good intentions start before we’ve even set foot in the gym. We get it: you’re busy, and despite our best efforts, inevitably life will sometimes get in the way of a scheduled sweat sesh. Long hair don’t care! There’s nothing more annoying than arriving at the gym, only to realize you don’t have a hair tie. Because while free-flowing locks is a tried-and-tested look for many a guy and girl, constantly flicking your hair from a face while trying to workout is a distraction no one needs. Make sure you always have a handful of hair ties tucked in your gym back – ribbon ties or spiral designs are ideal for a quick ponytail, without pulling or creasing hair; or go glam with Maria Shireen’s elegant hair tie bracelets. No time for a post-gym shower? Don’t sweat it! A spritz of dry shampoo is the ultimate after-exercise cheat to quickly zhush-up your do, meaning you can be out that door in no time. Pro-tip: give roots a quick blast under a dryer before applying, as the product absorbs less well if your hair is sweaty and wet. Gently massage in with your fingers, give it a quick brush to make sure it’s all evenly distributed, and voila! Instantly refreshed hair in second! For value and results, we still can’t beat Batiste brand. We can’t emphasize enough how important it is to stay hydrated during exercise! Not only does it help regulate body temperature, it also helps replenish the water you’re losing through sweat. But it’s not just what you drink that’s important – it’s also worth thinking about what you’re sipping from. A durable bottle will last much longer than a throwaway plastic one, helping to reduce your carbon footprint. Now shouldn’t that be everyone’s New Year’s Resolution?! We like Bobble brand for their great colors, cap-covered mouthpiece, leak-free design, and best of all, replaceable carbon filters to get rid of that icky chlorine taste! We all know that exercising with a full face of makeup is frowned on: when all that face paint mixes with sweat, it creates a recipe for blocked pores and – you guessed it – breakouts. But even more important that making time for a pre-gym class cleanse is giving skin a proper once-over after you’re done. All made from ultra-hygienic silicone, the LUNA range of facial brushes has been shown to remove 99.5% of dirt and oil – including makeup residue – and are a whopping 35x more hygienic than hands-alone cleansing. 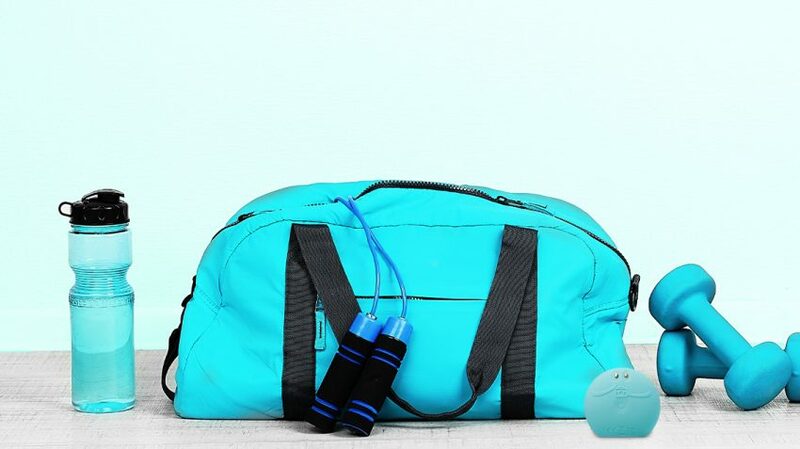 Because they resist bacteria buildup and hold their charge for up to 300 uses (oh hello, LUNA mini 2) they’re ideal for keeping in your gym bag for upping that post-workout glow. Alternatively, as your gym routine is making you faster, fitter and stronger, track your skin’s progress too, with LUNA fofo, the world’s first 2-in-1 cleanser and analyzer. Cute and compact, and fully waterproof for hitting the after-gym shower, it’s the ultimate personal, portable skin trainer! What are your go-to gym kit essentials? Let us know in the comments below!